Bach flower remedies are frequently used in a complimentary veterinary practice to help treat behavioral problems, to aid in training and to address different emotional imbalances such as: fear, anxiety and grief. Emotional imbalances may affect an animal's ability to heal and to respond favorably to his or her environment. Our animal companions experience a rich variety of emotions, including traumatic events- such as the loss of a loved one or a move from a favorite home- that may leave them extremely fearful or depressed. Just as with humans, sometimes our animal companions can get caught up in a psychological loop, which may actually worsen the condition. An example of such a loop could be the competition brought about by the introduction of a new puppy into the household. The new addition may cause the older pet to feel rejected and become depressed and withdrawn, or to even become very dominant. Either of these conditions may upset the household equilibrium, resulting in further reduction of the attention paid to the older pet, resulting in a worsening of the undesirable behavior. Everything our animal companions do through their actions and vocalizations are forms of communication. While it is not fair to completely anthropomorphosize (attribute human characteristics i.e. emotion(s) to an animal) their behavior, it is important to realize that they can suffer from grief, abandonment, separation anxiety and over-possessiveness, to name a few. The more attuned an animal is to it's owner, the more likely it is to pick up on, and be subject to, the owner's emotions and the stresses. The closeness of the relationship between pet and pet owner can be either beneficial or harmful, depending upon the influences involved. It is important to realize that some behavior problems are not really problems with behavior, but may be signs of physical illness. An animal is entitled to a thorough veterinary examination before they are characterized as having a stress or behavior-related disorder. Dr. Edward Bach in England developed the 38 Bach Flower remedies in the early part of the twentieth-century. The remedies are prepared from bushes, wild plants and trees and are neither harmful nor habit forming. There are two methods of preparing a Bach Flower remedy, using either the sun' s rays or boiling. The former method is similar to making sun tea with the flowers on top, while the latter method is similar to preparing an herbal decoction. Brandy is added as a preservative to both methods for stock preparations. 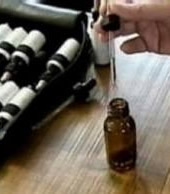 Bach flower remedies are not exactly like homeopathic preparations, although they are used in very dilute amounts and they can be affected by strong camphor-like smells such as: eucalyptus, moth balls, pine tar, etc. Strong sunlight and magnetic radiation also exercise a deleterious effect on the remedies. Unlike homeopathic preparations, the Bach Flower Remedies can be administered satisfactorily in food or water. If the community water dish is used as a delivery agent, animals not requiring certain remedies will not be affected adversely by their presence in the water. Personally, I have found that giving the remedy directly two to three times per day to work the best. In times of severe reactions, they may be given every few minutes. In some instances, you may notice a response in just few days, but it could take as many as two weeks before a change in behavior is apparent. Treatment usually lasts for three weeks, but may last for as long as three months to help the change become apparent. Most of our canine and feline friends do not react well to the brandy used to preserve the Bach Flower Remedies, therefore, when the remedies are compounded from the stock solution for the individual animal, the brandy is left out for cats, and only a minuscule amount added for dogs. The individualized remedy, if not used within the allotted time, therefore, may become contaminated and should be discarded. Refrigeration may sometimes help the shelf life of a compounded remedy. It is important to remember that if the dropper touches the animal's mouth, or is otherwise contaminated, it should be washed and cleaned thoroughly prior to being reinserted into the bottle. There is some dispute over how many remedies may be used in prescribing for an animal, which typically ranging from four to six prescriptions. A better guideline is to use the most indicated remedies, and if there are eight very strongly indicated, use all of them. We tend to rarely need more than five at any one time. As for which remedies to choose, using applied kinesiology is one way to select the appropriate remedy or combination of remedies. Another means is to put oneself into the animal's place and try to feel what they feel, sense what they sense, and then determine the remedies that most closely fit the animal's behavior, personality and/or emotions. This latter option obviously requires knowledge of the indications for use of each of the flower essences. One of the most commonly used remedies, which is actually a combination of five different flower essences, is called Rescue Remedy. Rescue remedy is one of the most important remedies that any complimentary first aid kit should have, as it can be used whenever there is shock, trauma or stress. In severe emergencies, it may be administered every few minutes to help the animal cope or survive. Rescue remedy is ideal to be given on the way to the veterinary hospital if the animal has been badly injured or is severely ill, as it will not interfere with other medicines. Rescue Remedy is available as a topical cream, as well as the usual internally administered liquid. We routinely use Bach Flower remedies to modify the behavior including: cats with inappropriate urination issues, very timid or aggressive animals, stressed animals in the hospital, animals that are depressed from illness or a change of their environment and on animals who are too bombastic, scattered or withdrawn. As for which remedy to use for a specific condition, there is no absolute formula, as the personality and environmental influences vary for each individual case. Indications for the remedies are listed in the Handbook of Bach Flower Remedies, by P.M. Chancellor. This valuable resource guide provides an in-depth description of all of the Bach Flower Remedies and serves as a useful reference for further use. There are many simplified listings of remedies' properties, which are wonderful for a quick reminder, but these lists should not be substituted for an in-depth study. Handbook of the Bach Flower Remedies, P.M. Chancellor, the C.W. Daniel Co. Ltd., 60 Muswell Rd., London, N 10, England (1971). Heal Thyself, Edward Bach, M.D., Keats Publishing, Inc., 27 Pine St., Box 876, East New Cannan, Ct. 06840. The Bach Remedies Repertory, F. J. Wheeler, M.D., ibid.